Speech is an NSAA activity that gives students the opportunity to practice public speaking, acting, writing, and research while also meeting students from other schools. The Mount Michael Speech Team is open to students in all grades and with all levels of experience. 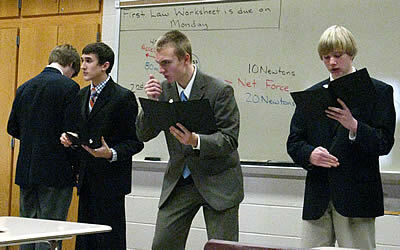 At Mount Michael, students who enroll in Advanced Speech receive course credit and meet once a week as a class. However, speech is also considered an extracurricular activity that requires time outside of school for preparation, practice, and competition. Speech tournaments begin on the first Saturday of November and continue through mid-March, when the district and state tournaments are held. The variety of events in which students can compete allows them to build on their talents and develop new ones, whether that involves persuasion, entertainment speaking, duet acting, dramatic interpretation, or impromptu speaking, to name a few.